The aim of this project is to extend the existing Videokymograph (VKG) capturing system by a sophisticated software designed to automatically evaluate the properties of high frequency recordings of human vocal fold vibrations and make a diagnose suggestion based on the retrieved information. Another goal for this project is to create a certified methodic for VKG examination process to be used in clinical praxis. The Voice and Hearing Centre Prague, Medical Healthcom, s.r.o. - a clinic specialized in vocal fold dysfunctions diagnosis. Dr. Svec & co, Faculty of Biophysics of the Palacky University in Olomouc, Czech rep. - team of the actual inventor of the VKG imaging technique. The Institute of Information Theory and Automation (UTIA) by Czech Academy of Sciences - a research institute specialized in image processing and analysis. Starmans electronics - a technological company with expertise in development of medical equipment. The software is currently in alpha stage still in development with basic functionality implemented, e.g. Automatic search and processing of 'interesting' sequences. Finding of the glottal opening. All sample data used in the project are gathered by The Voice and Hearing Centre Prague and are subject to anonymiztation and randomization process for patient privacy protection. The VKG images are created by acquiring a line-scan rows and putting them together in single image with the horizontal and vertical axis forming the space and time dimension respectively. 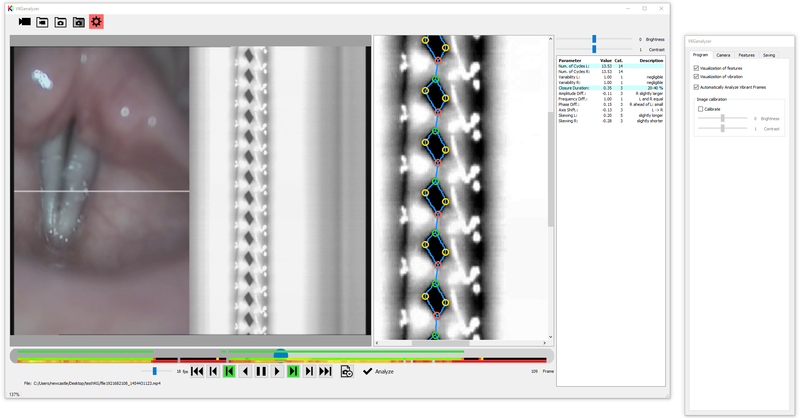 These images are used as an input for the VKG Analyzer software for automatic vibratory characteristics extraction.